Free Printable 80s Activities. Free Printable 80s Activities that you can share with your guests at your next 80s Party. Print free fun 80s Activities here. Print all the activities free using your home printer and have even more fun at the party. 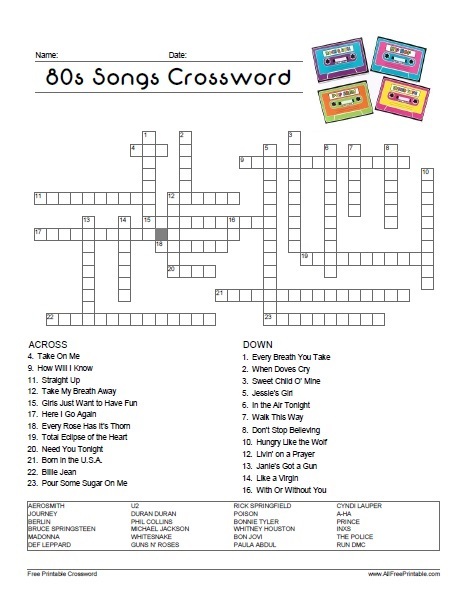 Great free printable activities for 80s that you can use to entertain your guests with 80s themed activities like 80s Songs Word Search, 80s Trivia, 80s Word Scramble and 80s Movies Crossword and much more. The free printable activities are easy to solve with the answers on page 2 of PDF. Click the link below to download or print the free 80s Activities Games now in PDF format.